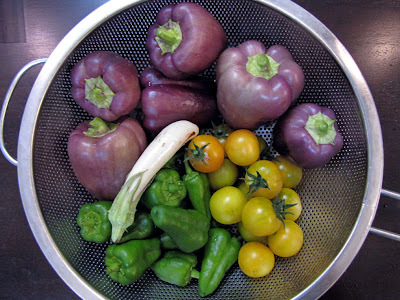 While I was expecting to pluck some cherry tomatoes and hot peppers from the container garden today I did not expect the eggplant and sweet peppers to be ready until late July, so this was a very pleasant surprise. I think this is an auspicious beginning to this year's vegetable growing season! Right now I've decided not to track the market value of my vegetable harvest, but I reserve the right to change my mind as the season progresses. Be sure to let some peppers sweeten on the plant before harvest. Wow! You already have peppers and eggplant! Our plants are growing so slowly with this heat wave. We have no flowers on either of those plants yet! Nom! Your harvest looks so fresh in delicious, especially in light of this heat wave. It will surely make a nutritious meal for you. Do you need to water your plants more than normal this year with all the extra heat? Those tomatoes are going to grow juicy and fast this year! Right now I water at least every other day. During the heat wave I watered every day, but I'll have to start doing that eventually anyway so it's not a big deal.